1 of 3 Coat slow cooker bowl with nonstick cooking spray. Add ketchup, brown sugar, soy sauce, Worcestershire, chili powder, garlic powder and paprika. Whisk until smooth; whisk in beer. 2 of 3 Add chicken, cover and cook on HIGH for 4 hours. Remove chicken to a plate and shred with 2 forks. Return to slow cooker and stir to coat chicken with sauce. 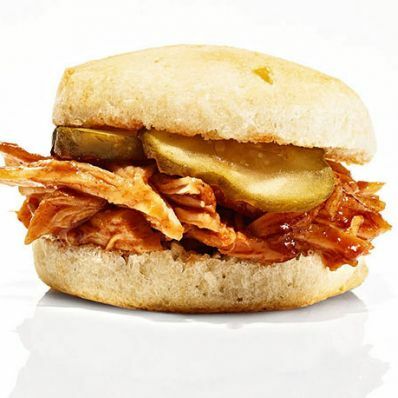 3 of 3 To serve, spoon about 1/4 cup chicken on each biscuit and top with 3 pickle slices. Per Serving: 0 g fiber, 11 g pro., 589 mg sodium, 195 kcal cal., 5 g Fat, total, 25 mg chol., 1 g sat. fat, 25 g carb.